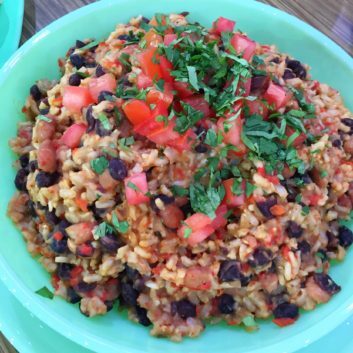 Rice and beans get a joyful makeover! With a few simple swaps, I lightened up this dish, bumped up the fiber, and even snuck in a veggie. The end result is a delicious dinner that’s totally kid (and adult) approved. Liberally coat large skillet with olive oil spray. Add onion and red bell pepper and sauté on medium heat for about 6 minutes, until soft and slightly browned. Add minced garlic and sauté for another 1-2 minutes. Add 1 cup dry brown rice, mix through and sauté for one minute. ​​Add pinto beans, black beans, ground cumin, vegetable broth and mix thoroughly. Bring to a boil, then cover skillet and lower to a simmer for 20 minutes if using instant rice or for the amount of time the rice package instructs (don’t lift lid during this time). Add salt and pepper to taste. To kick up the heat, add a dash of cayenne or a squirt of sriracha sauce. Makes six cups (6 servings).